Pure Pelvic Health was established by registered physiotherapist and experienced pelvic health practitioner Danielle Van Andel. Danielle has a Bachelor of Science degree in Human Kinetics from the University of Guelph with an interest in Reproductive Biology. In 2008 she graduated from McMaster University with a Master of Science degree in Physiotherapy. It was at McMaster that Danielle first became interested in Pelvic Health Physiotherapy. She took her first pelvic health course in 2010. After briefly working in a combined pelvic health and orthopedic practice, Danielle changed the focus of her career and accepted a position at The Center For Pelvic Health in Cambridge, ON in 2012. Here she participated in an intensive mentor ship program in Pelvic Health. Most recently she was the Clinical Leader at The Centre for Pelvic Health. As a life long leaner Danielle continues to pursue additional education in the area of pelvic health care. She has participated in multiple international conferences including the First World Congress on Abdominal and Pelvic Pain in Amsterdam, the Third World Congress on Abdominal and Pelvic Pain in Washington, and the International Society for the Study of Women’s Sexual Health Conference in San Diego. She has also participated in many courses and conferences on persistent/chronic pain including the NOI group s Explain Pain, and the International Spine and Pain Institute Conference in Minneapolis. 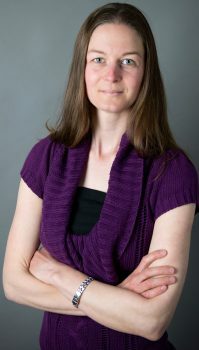 Danielle is also passionate about teaching, and is an Associate Clinical Professor (Adjunct) within the School of Family Medicine at McMaster University. She has had speaking engagements for many different health professions including Family Medicine Maternal Newborn Rounds. Danielle’s goal for Pure Pelvic Health is to create a friendly, clean, comfortable, professional environment where clients are at ease. Treatment is always based on the current best practice and the latest available research in the field. When not treating her clients, speaking with physicians, and participating in continuing education, Danielle can be found playing with her two children, gardening, hiking, horseback riding or reading. Kaitlin McCarthy is a registered physiotherapist who holds a Bachelor of Arts degree in Biology from Purchase College in New York State. In 2012, she earned her Doctor of Physical Therapy degree from City University of New York, Hunter College. She worked in a large hospital after graduation, gaining experience in mixed medical and surgical conditions. Kaitlin moved to Hamilton from New York in 2013 and became a registered physiotherapist in Ontario, practicing in outpatient orthopaedics. Kaitlin became interested in pelvic physiotherapy following the birth of her first son in 2015. After experiencing successful treatment of her own postpartum pelvic floor dysfunction, she decided to shift her focus of practice. Kaitlin has taken several courses in treatment of pelvic floor dysfunction as well as treatment of pain. She is rostered with the College of Physiotherapists of Ontario to perform internal pelvic assessment and treatment. Kaitlin is passionate about helping clients return to their favourite activities without the burden of pelvic pain or incontinence. She is especially interested in postpartum rehabilitation and return to exercise. Kaitlin enjoys learning and makes continuing education a vital aspect of her practice. When not working with patients and participating in continuing education Kailtin enjoys spending time outdoors with her husband and 2 sons, exercise, reading and cooking.